Due to the submarine-like nature of working on a PhD, my blog writings have been sparse if not wholly absent. 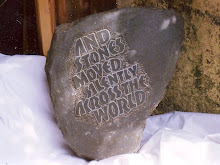 I am now, however, surfacing and working away on ideas for the next stone with the grand and insightful assistance of Karen Christopher. "Sometimes it takes more courage to not know than to know prematurely. Remaining with the not knowing is uncomfortable, difficult: it suggests a failure or an inability. Truthfully though, at this point I simply do not know what to do next." I wonder if our ability to sit with failure mightn't be a more successful strategy than continually grinding forth mantras about the need to succeed or how we deserve to succeed. An inability to act might, on numerous occasions, induce a greater degree of reflection and a more realistic appraisal of things to come. Also, it introduces us to our great capacity for human fallibility and this is necessary and a significant part of what we consider to be intelligence. the push to progress, to make something happen - or 'drill, baby, drill' in this instance - now reveals a remarkable lack of foresight as to what the difficulties of drilling in deep water might be. And so, I have been with my uncomfortable not knowing for quite some time now - and it has indeed been uncomfortable and at one point even led me to consider giving back the funding I had received from the Arts Council. Things are now moving in a more definite direction however - and there will be news of this very soon!